This church, already cited in the Corpus Inscriptionum Latinarum (CIL) because two ancient inscriptions now in the S. Francesco Art Museum1 had been found in the interior, has recently given us two more classical inscriptions: they were discovered in 1970 when the building was restored 2. 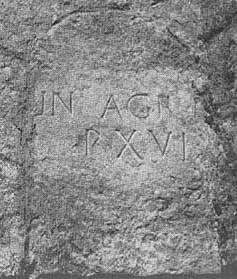 Trevi, Italy - Church of S. Andrea in Collecchio, , ancient inscription number 1 A slab of local limestone measuring 53 × 112 × 22 cm was at the time being used as part of the chancel step. It is now set up against the entrance wall. Its corners are somewhat damaged: the lower left corner is completely missing. The inscription here reproduced is in two lines, 68 and 56 mm high respectively, and it only occupies the upper portion of the stone. An irregular 22 × 13 cm hollow has damaged both lines. The first line might be interpreted: T(itus) AV(fidiu)S - or AV(gustu)S, or AV(reliu)S, or AV(soniu)S, or AV(ienu)S, - T(iti) L(ibertus), but no adequate suggestion has been made for the part missing in the second line. Before ENES the lower part of a letter can be made out: it might be a G or an S.
The letters are well aligned and carefully carved, but have been partly damaged by weathering, to which they have obviously been exposed over a long time. Although it is impossible to date this inscription from its content, the shape of the letters lets us tentatively assign it to the first centuries A.D.; the presence of the letter Y further betrays an inscription later than the republican era. Another inscription, although carved in a stone reused in the left-hand corner of the façade, had remained unnoticed because a thin layer of plaster had filled in the letters. It was only by the particularly strong light of the sun at noon, grazing the stone, that some kind of sign was eventually made out. Today, a nearby pew, although convenient, hides the inscription somewhat. The letters of the first line are 65 mm high; those of the second, 75 mm. The second line is shifted to the right, which might lead us to assume other letters beyond the AGR in the first line as it originally read, but the rounding of the upper portion must surely represent the original cutting of the stone. From an epigraphic standpoint this inscription is of no interest since it repeats a formula extremely common in funerary inscriptions, indicating a grave area 16 feet deep. These funerary inscriptions, together with the other two already found in this little church, mark the presence of a road already existing in Roman times (since it was along roads that they used to bury the dead) and thus bear witness to the antiquity of the road from Trevi to Foligno.